If you are a real fan of The Lord of the Rings franchise, then today is your happy day, because we are going to tell you lots of interesting and fresh information about a game, entitled Middle-earth: Shadow of Mordor. Thus, yesterday the new Middle-earth: Shadow of Mordor trailer appeared on the official video channel of the project. This trailer not only shows us the events, which have laid the foundation of the upcoming game’s story line, but it also reveals the release date of the project. But let us tell everything in order. So, according to the video, Talion - the game’s protagonist - comes to life after he and all his family were brutally murdered by Sauron’s henchmen. But our hero, unlike his wife and son, isn’t dead, he becomes possessed by the spirit of vengeance, which gives him some superhuman powers. Our protagonist won’t stop to punish those who are guilty in the murder of his family and finally get the opportunity to join the wife and the son in the eternity. But while we are waiting for the project’s release, we suggest you watching and appreciating fresh Middle-earth: Shadow of Mordor trailer. Don’t forget to write your opinion about the video and the main character in the comments below. Besides, as we told you earlier, Middle-earth: Shadow of Mordor release date and the pre-order bonuses have been revealed. Thus, this action-RPG will be launched on the 7th of October for the current and next-gen consoles, as well as for PC. 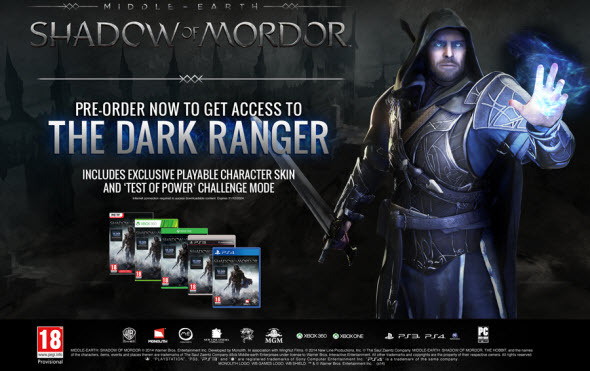 As for the bonuses to those who will pre-order the game, the developers have had a fit of generosity and have offered a set, entitled The Dark Ranger. It includes a skin, published below, Test of Power (you have to defeat the Sauron’s commanders to get some additional advantage at the beginning of the game), as well as a possibility to be added to the exclusive leaderboards for this test.